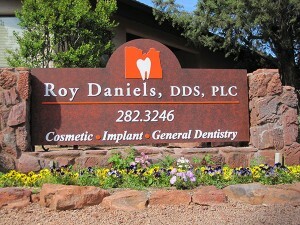 Dr. Roy Daniels invites you to experience our highly skilled, caring team who is committed to providing you, the Sedona dentistry patient with a comfortable and relaxing visit. Our team includes experienced dental professionals, led by Dr. Daniels. We each share Dr. Daniels’ belief that our care should be comprehensive and courteous – responding fully to your individual needs and preferences. Supporting an office environment that is warm and friendly, our office receptionist greets every patient, and makes every attempt to set appointments that can accommodate your personal schedule. She is also at your service to explain and facilitate insurance and financial arrangements. And our team’s commitment extends beyond your Sedona dental visits. We stay in touch by newsletters, sharing information about our office and ways you can take better personal care of your teeth. We contact you to see if your most recent treatment is satisfactory, and we call to remind you of upcoming appointments. Monday-Thursday: 8:00 a.m. to noon, 1:10pm to 4:00 p.m.
Our office is closed daily for lunch from noon to 1:10 p.m.
from 8:00 a.m. to 9:00 a.m.